Transforming growth factor-β (TGFβ) plays an important role in late-stage carcinogenesis by stimulating invasive behavior of cancer cells, promoting neo-angiogenesis and by helping cancer cells to escape surveillance by the immune system. It also supports colonization of the bone by metastatic breast cancer cells by increasing expression of osteolytic parathyroid hormone-related protein (PTHrP). Interfering with TGFβ signalling may thus weaken the malignant properties of cancer cells. We investigated to what extent two inhibitors, SB-202190 and SB-203580, interfere with TGFβ-signalling in invasive MDA-MB-231 breast cancer cells. These compounds, formerly used as p38-MAPK-specific inhibitors, were recently also demonstrated to inhibit TGFβ type I receptor kinase. Our results show that these inhibitors delay the onset of TGFβ-induced nuclear accumulation of Smad3 and reduces its amplitude. This effect was accompanied by a strong reduction in TGFβ-responsivess of the slow-responder genes pthrp, pai-1 and upa, while the reactivity of the fast-responder gene smad7 to TGFβ remained almost unchanged. Neither was the TGFβ response of the fast-responder ese-1/esx gene, whose expression we found to be strongly downregulated by TGFβ, affected by the inhibitors. The data show that SB-202190 and SB-203580 suppress TGFβ-dependent activation of genes that are important for the acquisition of invasive behavior, while having no effect on the expression of the natural TGFβ inhibitor Smad7. This suggests that these compounds are potent inhibitors of malignant behavior of cancer cells. Malignant tumor cells frequently show deregulation and hyperactivation of signalling pathways, one of which is represented by the TGFβ signal transduction pathway . TGFβ has been shown to potently inhibit proliferation of most epithelial, endothelial and hematopoietic cells . However, during tumor progression malignant cells may become refractory to TGFβ-mediated cell cycle arrest. In later stages of tumorigenesis, TGFβ can act as a stimulator of invasion and metastasis  acting directly on the tumor cells or inducing angiogenesis and facilitating local and systemic immunosuppression, respectively . For example, TGFβ may stimulate the expression of proteases such as uPA, MMP-3 or MMP-9, enzymes frequently overexpressed in invasive tumor cells [5, 6]. TGFβ signals through a heteromeric receptor complex of type II and type I receptor serine-threonine kinases, which activates the downstream Smad signal transduction pathway . After TGFβ binding to the receptor complex, the TGFβ type II receptor kinase phosphorylates TGFβ type I receptor which inititates the downstream response by phosphorylating receptor-regulated Smads (R-Smads), such as Smad2 and Smad3. By forming a multimeric complex with the Co-Smad Smad4, activated R-Smads translocate to the nucleus and induce transcriptional modulation of target genes . Breast cancer cells frequently metastasize to bone causing bone destruction and hypercalcemia . Parathyroid hormone-related protein (PTHrP), secreted by these cells, is a major mediator of the osteolytic process . Osteolysis leads to the release of TGFβ which, in turn, further induces PTHrP expression . Other tumor-relevant genes, such as pai-1 or upa, can also be activated by TGFβ. Hence, downregulation of TGFβ mediated gene expression may counteract malignancy of cancer cells. In this study, we investigated whether two small molecules, SB-203580 and SB-202190, could be used to downmodulate TGFβ-induced transcriptional activation of TGFβ target genes. In the past, these compounds have been widely used as specific p38 inhibitors  and their inhibitory action has been well documented [13–15]. However, recent results show that, in a comparable concentration range they inhibit the serine/threonine kinase activity of TGFβ type I receptor preventing phosphorylation of R-Smads [16–18]. Here we show that, in the highly invasive breast cancer cell line MDA-MB-231, the SB-202190 and SB-203580 inhibitors negatively altered Smad3 nuclear entry upon TGFβ stimulation. This resulted in a reduced response of TGFβ-inducible genes to TGFβ. The degree of inhibition varied tremendously depending on the particular gene analyzed. Plasminogen activator inhibitor-1 (PAI-1) and PTHrP are known target genes of TGFβ signalling. We have previously demonstrated that TGFβ upregulates PTHrP and PAI-1 RNA levels in MDA-MB-231 cells . TGFβ affected PTHrP expression primarily by increasing the level of the promoter P3-specific transcript . Quantitative PCR analysis using primers allowing the detection of PTHrP P3 and PAI-1 transcripts indicated that incubation of MDA-MB-231 cells with SB-202190 and SB-203580 greatly inhibited TGFβ-induced increase in PTHrP and, to a lesser extent, PAI-1 mRNA levels (Fig. 1A,1B). Upregulation of TGFβ target genes is diminished by SB-202190 and SB-203580. A and B, Real-time RT-PCR measurement of PTHrP P3 promoter and PAI-1 transcripts. Cells were incubated with 5 ng/ml TGFβ for four hours. C and D, Transient transfection assays using the 3TP-Luc reporter plasmid. Cells were treated with TGFβ for seven hours, lysed and luciferase activity was measured and normalized to β-galactosidase activity. Cells were incubated with DMSO or the SB-202190 (A+C, 1–10 μM) and SB-203580 (D+E, 5–20 μM) 45 min prior to TGFβ addition. Fold activations relative to untreated samples were calculated. Next, we examined whether inhibitory effects of these compounds can also be seen on the PAI-1 promoter in transient transfection assays. By using 3TP-Luc as a reporter plasmid we observed that TGFβ increased the activity of 3TP-Luc by approximately 3.5-fold (Fig. 1C,1D). Preincubation with the SB inhibitors reduced this activation almost to basal levels. These data suggest that SB-202190 and SB-203580 inhibit TGFβ-stimulated gene expression at least in part by downregulating transcription. It has recently been shown that SB-202190 and SB-203580 are able to inhibit TGFβ-induced phosphorylation of Smad3 by the TGFβ-receptor I kinase (ALK5) and to interfere with nuclear localization of Smad3 . Nuclear translocation of Smad3 results directly from TGFβ-induced Smad3 phosphorylation and is, therefore, a measure of the activation status of ALK5. We wanted to know to what extent SB-202190 and SB-203580 interfere with TGFβ-dependent Smad3 nuclear import in the invasive MDA-MB-231 breast cancer cell line. We prepared nuclear and whole cell extracts from cells treated with TGFβ with or without preincubation of one of the SB inhibitors and analyzed those extracts for reactivity to a Smad2,3-specific antibody by Western blot analysis. This antibody primarily interacts with Smad3, but, to some extent, it is also able to recognize Smad2. Based on Northern blot hybridization data, Smad3, but not Smad2, is expressed in MDA-MB-231 cells . Hence, the data presented in Fig. 2 show the abundance of Smad3 in the nuclear and in the whole cell extracts. We found that preincubation of cells with either SB-202190 or SB-203580 decreased the level of nuclear Smad3 in the presence of TGFβ (Fig. 2A), whereas the total Smad3 protein level, as assayed in whole cell extracts, was not altered. SB inhibitors deregulate TGFβ induced Smad3 nuclear accumulation. A, Western Blotting analysis of whole cell and nuclear extracts of cells treated with 5 ng/ml TGFβ for 30 min after 45 min preincubation with DMSO or SB-202190 (10 μM) and SB-203580 (20 μM). Smad3 protein was detected using a mouse monoclonal Smad3 antibody from Santa Cruz. B, Western Blotting analysis as in A using nuclear extracts of cells stimulated with TGFβ for the indicated times after 45 min preincubation with DMSO or SB-203580 (20 μM). C, same as in A with inhibitors SB-203580 (20 μM), PD98059 (40 μM), Y-27632 (20 μM) or PMA (25 nM), respectively. Coomassie staining and reprobing of blots with a control antibody (PKCα) ensured equal protein loading for all lanes (not shown). Next, we studied the time-course of TGFβ-induced Smad3 nuclear entry in the presence or absence of SB-203580. MDA-MB-231 cells were stimulated with TGFβ and harvested after various time points. Nuclear extracts were prepared and subjected to Western blotting analysis using an anti-Smad3 antibody. Stimulation of the cells with TGFβ led to a rapid increase in nuclear Smad3 protein within 15 minutes and this level remained constant for 2 hours. Thereafter it started to decrease. However, pretreatment of the cells with 20 μM SB-203580 perturbed Smad3 nuclear accumulation, reducing the amount of Smad3 entering the nucleus and shifting the peak level of nuclear Smad3 to a later time point. We next explored the possibility that the MEK1/2 inhibitor PD98059 and the Rho-associated kinase inhibitor Y-27632 might also interfere with Smad3 nuclear entry. However, both agents failed to reproduce the effect of the SB inhibitors as TGFβ-induced nuclear accumulation of Smad3 was not affected by these inhibitors (Fig. 2C). We also used the protein kinase C (PKC) activator phorbol-12-myristate-13-acetate (PMA) (Fig. 2C), which appeared to enhance the amount of both basal and TGFβ-induced nuclear Smad3, a phenomenon that has been reported earlier . 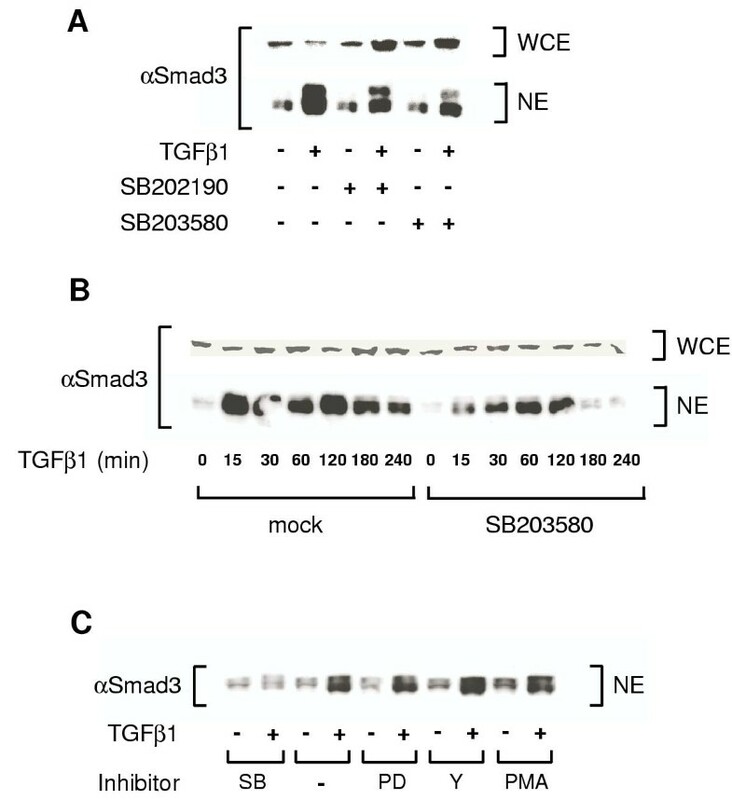 The delayed TGFβ-mediated entry of Smad3 into the nucleus in the presence of SB-203580 prompted us to examine the effect of SB-203580 on TGFβ-induced gene expression in a time-course experiment. We isolated total RNA from the same cell suspension that was used to prepare nuclear extracts for time-course analysis in Fig. 2B. cDNA was synthesized and subjected to quantitative RT-PCR in order to measure the transcript levels of several TGFβ target genes. The genes being examined were divided into two groups: I, known TGFβ target genes: pai-1, smad7, c-myc, upa and pthrp (Fig. 3A,3B,3C,3D,3E) and II, ets family genes: ets-1, ets-2 and ese-1/esx. Smad7 was of particular interest as it belongs to the inhibitory Smads, which can counteract TGFβ-induced gene activation . The response of the smad7 gene to TGFβ is unusually rapid  which is believed to stem from the peculiar nature of the Smad7 promoter that contains a "perfect" Smad binding site . Another inhibitory Smad protein is Smad6. We have not analyzed the expression of this protein, since it preferentially inhibit bone morphogenetic protein (BMP)-induced expression . In addition, Smad6 shows varying effects on TGFβ signalling . Nor were TGFβ-responsive genes, such as p21, studied that are involved in cell cycle regulation. Such genes are important targets at early-stage carcinogenesis, where TGFβ has a tumor-suppressive rather than a tumor-promoting function . In addition, e.g. p21 protein is not dectable in MDA-MB-231 cells . TGFβ target genes respond differentially to SB-203580. Real-time RT-PCR analyses of mRNA derived from MDA-MB-231 cells treated with TGFβ for 15, 30, 60, 120, 180 and 240 min. Filled line indicates TGFβ-induced activation in the absence of SB-203580, dotted line represents activation by TGFβ in the presence of this inhibitor. Relative transcript level was calculated by normalizing transcript levels in induced relative to uninduced samples. A-E, known TGFβ target genes. F-H, ets family members. Of group I, pai-1, pthrp and upa mRNAs were induced upon TGFβ treatment reaching maximum activation within three hours. As expected, the smad7 transcript was fully upregulated much earlier, after approximately 60 min. The c-myc gene has been reported to be unresponsive to TGFβ signal transduction in MDA-MB-231 cells . We also measured the effect of TGFβ on c-myc RNA and confirmed these results as SB-203580 or control treatment failed to significantly modulate c-myc transcript levels. The inhibitory effect of SB-203580 showed remarkable variation among the genes examined. The rapid induction of smad7 mRNA was basically unaffected by SB-203580; this could possibly explained by a lower amout of Smad3 necessary to activate the Smad7 promoter. TGFβ induced pai-1 mRNA was reduced to approximately 50% by the SB inhibitor, whereas TGFβ-mediated expression of PTHrP and uPA was highly sensitive to SB-203580 treatment. SB-203580 downmodulated expression of the latter genes to almost basal levels. Two ets genes, ets1 and ets2, were also affected by TGFβ and SB-203580 (Group II, Fig. 3F,3G). We observed that ets1 and ets2 transcript levels were slightly upregulated when cells were incubated with TGFβ and that this increase was partly inhibited by SB-203580. The other ets gene that we tested was ese-1/esx, a recently characterized member of the ets gene family, originally identified in epithelial cells . Ese-1/Esx has been found to regulate the expression of TGFβ type II receptor . We could show for the first time that the level of the Ese-1/Esx transcript was strongly downregulated in the presence of TGFβ. The negative TGFβ effect on Ese-1/Esx expression could not be inhibited by SB-203580. Evidence has been accumulated that TGFβ promotes late-stage tumorigenesis by stimulating angiogenesis and invasive behaviour of tumor cells, enhancing immunosuppression and supporting epithelial-mesenchymal transition of cancer cells . Furthermore, TGFβ is believed to be part of a vicious circle in bone metastases as it gets released from osteoclast-degraded bone substance and subsequently stimulates PTHrP gene expression in nearby metastatic cancer cells which in turn leads to an activation of osteoclastic bone resorption . Therefore, it is of great interest to understand in more detail the molecular aspects of TGFβ-mediated gene expression in metastatic breast cancer cells and to explore ways to interfere with this tumorigenic signalling. Here we report that two small molecules, SB-202190 and SB-203580, diminished TGFβ-induced expression of TGFβ target genes which was accompanied by a perturbation of TGFβ-mediated Smad3 nuclear accumulation, a crucial step in TGFβ signal transduction. Using SB-203580, we found that not only was the total level of nuclear Smad3 in the presence of TGFβ reduced, but also that the nuclear entry of Smad3 was delayed and less prolonged. Interestingly, treating cells with TGFβ for 60 min yielded a similar amount of Smad3 in the nucleus, irrespective of whether SB-203580 was present or not. However, when the time of TGFβ treatment was reduced to 15 min or prolonged to 180 or 240 min, SB-203580 had a tremendous effect on Smad3 translocation to the nucleus. The altered kinetic of TGFβ-dependent Smad3 nuclear entry as induced by SB-203580 coincided with the efficacy by which this agent repressed the activity of the different TGFβ target genes. Fast TGFβ responder genes, such as smad7, whose maximum activation by TGFβ was reached after 60 min, was only slightly affected by SB-203580, while slow responders, such as pai-1, pthrp or upa, that showed peak activation after 180–240 min, were very sensitive to the repressive effect of SB-203580. 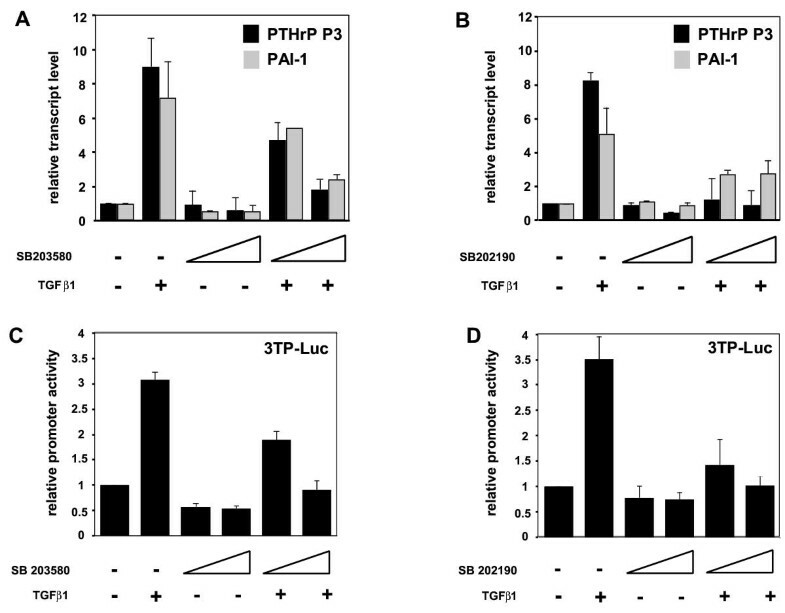 The strongest effect of SB-203580 was found on the TGFβ-dependent expression of pthrp and upa. In these cases, the inhibitor completely eliminated responsiveness to TGFβ. How could these differential effect of SB-203580 on TGFβ-induced gene expression be explained? It is clear that the smad7 gene expression is regulated by TGFβ in a Smad3/4-dependent manner  as it was found for the pthrp and the pai-1 gene [19, 33]. However, the Smad3 responsive elements are different. The smad7 gene contains a perfect palindromic Smad binding element (GTCTAGAC) while the pai-1 and the pthrp promoters harbor AGAC tandem repeats [19, 33] which binds Smad proteins less efficiently . The upa gene contains only an AP1-binding site which resembles the Smad3/4-responsive AGAC motif . A weaker binding site could require Smad3 to be present at higher concentrations for efficient binding and would make TGFβ-dependent transcription from a gene more vulnerable to reduced nuclear accumulation of the Smad3 protein. TGFβ-induced stabilization of the mRNA may also be important for the sensitivity to SB-203580. TGFβ has been shown also to stabilize the mRNA of the smad7 gene , while stabilization of RNA does not play a major role in regulation of the pthrp gene in MDA-MB-231 cells . In addition, SB-203580 also inhibits p38 activity which has been shown to play a role in TGFβ signalling [36–41]. Hence, several factors could be responsible for the differential sensitivity of TGFβ-responsive genes to SB-203580. Members of the Ets family of transcription factors share a unique DNA binding domain, the Ets domain, and have been shown to activate a large number of genes [42, 43] and to be involved in a number of physiological and pathophysiological processes . There has been accumulating evidence that Ets proteins play an important part for the invasive program of cells, particularly by stimulating the expression of protease genes [45, 46]. Ets1 and Ets2 are overexpressed in a variety of tumors, including breast carcinomas ( and references therein). Furthermore, our previous work has shown that, in invasive breast cancer cells, Ets proteins activate the PTHrP P3 promoter in cooperation with Smad3 . In this context it is interesting to note that TGFβ signalling seemed to target the ets-1 and ets-2 gene (Fig. 3F,3G). Analysis of the human ets-1 promoter sequence revealed that it contains elements similar to TGFβ-responsive sites in other promoters (R. Lindemann, unpublished observation). We present data showing that TGFβ downregulated the Ese-1/Esx transcript, a novel and yet unpublished finding. Ese-1/Esx is a member of the Ets transcription factor family and is expressed mainly in epithelial tissue . Its expression has been detected during mammary gland development and breast tumorigenesis [47, 48]. It is noteworthy that Ese-1/Esx is a potential transcriptional regulator of the TGFβ type II receptor  and overexpression of Ese-1/Esx in non-invasive cells leads to a reduction in cell growth in the presence of TGFβ, presumably because of an increased TGFβ type II receptor level . It is interesting that TGFβ-dependent downregulation of Ese-1/Esx is not affected by SB-203580. It is possible that TGFβ does not require Smad3/4 or p38 to inhibit Ese-1/Esx-expression. Alternatively, inhibitory Smad7, whose expression was increased by TGFβ but not affected by SB-203580, may be involved in this process. One way by which Smad7 can inhibit TGFβ-dependent gene expression is by blocking phosphorylation, and, hence, nuclear import of Smad3 and Smad2 . More recent data showing that Smad7 is able to interact with histone deacetylases suggest an additional role for Smad7 as a transcriptional co-repressor . Thus, Smad7 might interfere directly with Ese-1/Esx gene transcription. However, TGFβ downregulated Ese-1/Esx mRNA levels faster than it upregulated Smad7 expression excluding the possibility that Smad7 mediates the TGFβ effect on Ese-1/Esx, at least at the initial phase. Another candidate that could be responsible for this process is c-Jun N-terminal kinase (JNK). JNK has been described to drive TGFβ-dependent fibronectin synthesis independent of Smad4 and p38 . In contrast to Smad3, JNK is activated by the TGFβ receptor I in a way that does not require the kinase domain . This supports the notion that activation of Smad3 and JNK by TGFβ are independent events. It is remarkable that a constitutively active form of JNK activator MKK and Smad7 are able to cooperatively downregulate TGFβ-responsive promoters . It is quite possible that a Smad7/JNK synergistic interaction is involved in the TGFβ-dependent downregulation of Ese-1/Esx expression, where JNK alone might mediate the initiation of the TGFβ-induced repression. We demonstrate that treatment of invasive MDA-MB-231 breast cancer cells with SB-202190 and SB-203580 interferes with TGFβ-induced Smad3 nuclear accumulation and that this is paralleled by a differential transcriptional response of TGFβ target genes. Strikingly, SB-202190 and SB-203580 suppressed TGFβ-dependent activation of those genes that are important for the acquisition of invasive behavior, while having no effect on the expression of the natural TGFβ inhibitor Smad7. This suggests that these compounds may be useful to interfere with malignant behavior of cancer cells. Furthermore, we show for the first time that, in breast cancer cells, the Ese-1/Esx mRNA is downregulated by TGFβ. MDA-MB-231 breast cancer cell line was maintained in Dulbecco's modified Eagle's medium (Invitrogen) supplemented with 10% fetal calf serum (Invitrogen). The plasmid 3TP-Luc was kindly provided by Y. Sun. TGFβ1 was purchased from R&D Systems and dissolved in 1 mg/ml bovine serum albumine in 4 mM HCl as recommended by the manufacturer. The inhibitors PD-98059, Y-27632, SB-202190 and SB-203580 were obtained from Calbiochem and dissolved in dimethyl sulfoxide. Transient transfection of MDA-MB-231 breast cancer cells has been described previously . Briefly, 2 μg 3TP-Luc together with 0.3 μg β-galactosidase expression plasmid were transfected into cells grown to 70–80% confluency in 6-well plates using LipofectAMINE reagent (Invitrogen) following the manufacturers protocol. TGFβ stimulation of cells (5 ng/ml) was performed 15 hours after transfection for the indicated times with or without preincubation with the respective inhibitors. Control cells were treated with the equivalent amount of TGFβ dissolving buffer (1 mg/ml bovine serum albumine in 4 mM HCl). Cells were lysed and assayed for luciferase activity as described in Blumenthal et al . For calculation of relative promoter activity, luciferase activity was normalized against β-galactosidase activity. Nuclear extracts were obtained as described elsewhere . 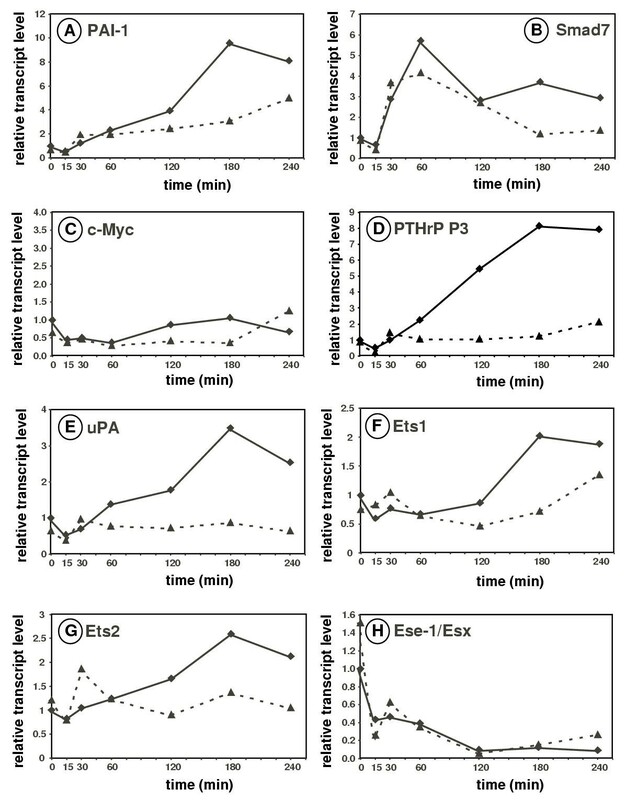 Briefly, detached cells were resuspended in buffer A (10 mM Hepes pH 7.9, 10 mM KCl, 0.1 mM EDTA, 0.1 mM EGTA, 1 mM dithiothreitol, 0.5 mM phenylmethylsulfonyl fluoride) and cells were lysed with Nonidet P-40. After centrifugation at 13000 rpm for 1 min, nuclei were extracted by addition of buffer C (20 mM Hepes pH 7.9, 0.4 M NaCl, 1 mM EDTA, 1 mM EGTA, 1 mM dithiothreitol, 0.5 mM phenylmethylsulfonyl fluoride). Whole cell extraction was performed by lysis of cells in 250 mM Tris-Cl pH 7.5, three cycles of freezing and thawing and a subsequent centrifugation step for 5 min at 13,000 rpm at 4°C. Total protein amount in the extracts was determined using the Bio-Rad Bradford reagent. Cell extracts were analysed by Western Blotting analysis as reported previously . Mouse anti-Smad3 (H-2) and rabbit anti-PKC alpha (C-20) were purchased from Santa Cruz Biotechnology and diluted 1:1000. Visualization of protein bands was carried out using anti-IgG horseradish peroxidase and ECL plus reagents from Amersham Pharmacia Biotech. This work was supported by the Dr. Mildred-Scheel-Stiftung Grant 10-1601-No3. Author 1 (RKL) carried out the experiments. Author 1 (RKL) and Author 3 (JD) drafted the manuscript. Authors 1 (RKL) and Author 3 (JD) have conceived and coordinated the study. Author 2 (AN) participitated in coordination. All authors read and approved the final manuscript.